Sometimes, when I feel that I couldn't hurt anymore and I'm teetering on the brink, my lovely boy is a beautiful distraction. This week is one of those weeks, Anabelle's upcoming remember day and birthday and everything in between is hitting me hard. I'm overwhelmed by things I cannot control. I'm tired. If possible, this third year is hurting more than the years before. Is this the pattern to come? Each year feeling harder than the last? Who said time heals when my heart feels raw and broken as if she died yesterday? Today has seen every emotion; tears, pain, happiness, excitement. And my solace? The company of my boy. Today I felt relief when I picked him up from nursery. For a little while nothing else mattered, me, my boy and playtime. Exploring his new sand and water table! He has been a delight this evening; cheeky, inquisitive and loving. My boy. Right up until bedtime, playing boo with himself in the landing mirror; something I will have to catch on video if I can! We are blessed to have him. 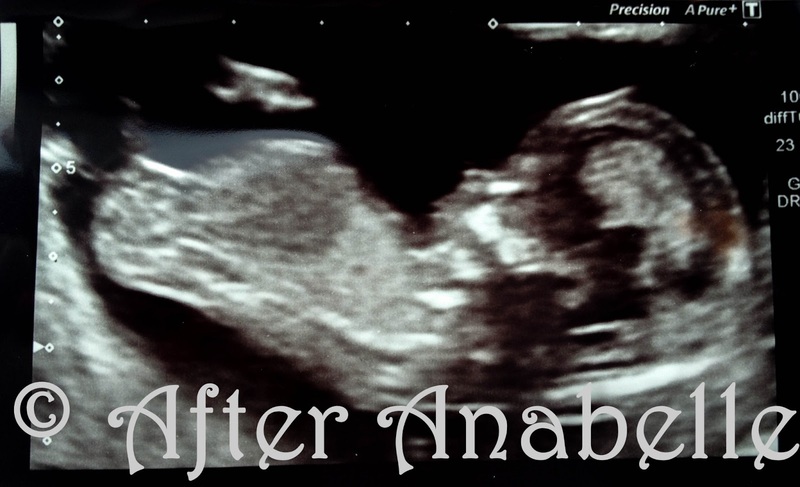 We were, we are blessed to have Anabelle, if only for a short time. We are blessed to have this baby. Yes, this is Mini Morgan the Third. Due to join us in December. As you can see, at the moment out lives have turned into another rollercoaster. We're of course happy and elated to be having our third child, I'm excited. But we're also scared, knowing that this point and second trimester means little for guaranteeing this beautiful baby comes home. The tipping point between fear and hope is slim. Today was our 3rd scan so far this pregnancy. This morning I had convinced myself there would be no baby at the scan, that this little blob would have left us. Then there it still was; wriggling, rolling, curling, kicking, waving. And we left with a beautifully clear picture. I think it already has the same nose as the other two. At the moment I'm feeling particularly vulnerable. Tears are just below the surface and so easily shed. Hormones coupled with the pain and hurt for Anabelle that is heightened over these next few weeks. Grief is all consuming. Once again I'm left wondering how on earth we survive this forever. I can only hope we emerge into July feeling a little more together again. And I can only hope for another baby rainbow and come Christmas I will find relief in the company of two of my children. How I wish it was the three. Please stay safe little one. My first rainbow is due in December too. I'm 13 weeks but we haven't announced it yet. I'm too scared to tell everyone! I'm glad you are having another rainbow but sorry to hear that it is stirring up the grief all over again. It's such a hard journey. We lost our angel Poppy on Halloween last year and some days it feels like yesterday again. The hormones don't help. My EDD is 18th December. Is yours similar? I'm 13+2 today. I'm so sorry to hear about Poppy. It will be three year since Belle died on Sunday, and her birthday next Friday. So often it feels like yesterday, but especially at the moment. Very raw and reliving it again. I wish you a smooth and uneventful pregnancy. Reach out for support where you can. Do you use the Sands forum boards or local groups. There will be lots of support online and some have next pregnancy support groups you can go to. I wish you every joy possible with the new baby. Your third child. Belle's brother or sister as well as Xander's.